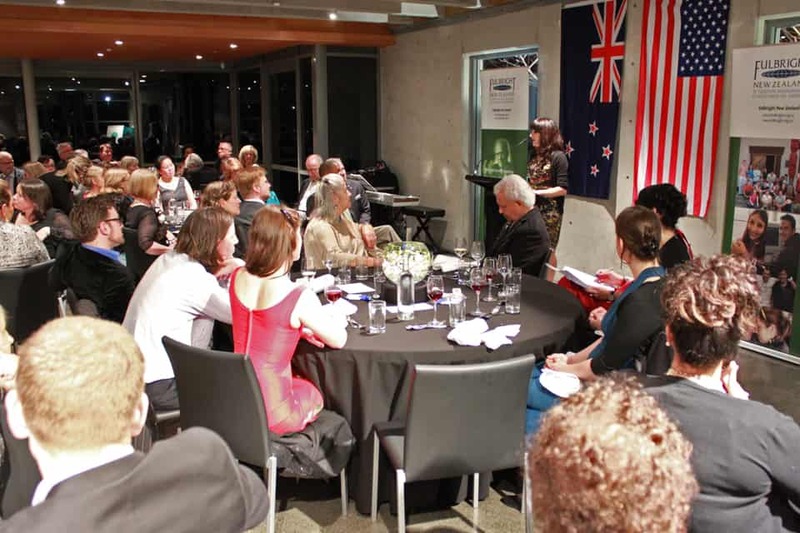 On 7 September 2013, 90 guests attended the a gala dinner at Villa Maria Estate in Auckland to celebrate the 65th anniversary of Fulbright New Zealand. 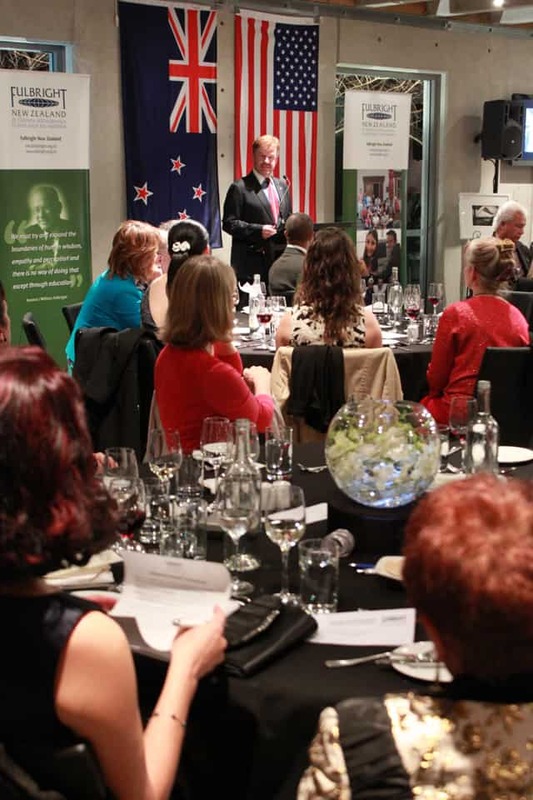 Speakers included Fulbright New Zealand chairperson Helen Anderson, the US Ambassador to New Zealand, Hon David Huebner, and alumni Charles Royal, Megan Couture and Natalie Coates. Also included in the programme were a creative reading by alumna Ghazaleh Golbakhsh and singing performance by alumna Frances Moore. Three artworks by alumni Paul Cullen, Richard Maloy and Raewyn Turner (in collaboration with Brian Harris) were sold by silent auction, and guests answered a fun quiz about the history of Fulbright New Zealand, its exchange programmes and alumni. Members of Parliament, Fulbright alumni, honored friends of Fulbright , good evening & welcome. I am delighted to be with you here at Villa Maria tonight as we celebrate the 65th anniversary of the establishment of the Fulbright program in New Zealand. This is an impressive milestone for a transformative program that has contributed immensely to New Zealand society, to the strong relations between our two societies, and to peace and prosperity in our shared Pacific neighborhood. That conclusion is not an overstatement, and I do not make it lightly or reflexively. Of course, I fully understand that it is easy to undervalue or discount the return on investments such as the Fulbright Program. There are two culprits. First, we live in a Short-Attention-Span era, when the primary focus is on what’s immediate, controversial, flashy, or ill-considered , on transactions rather than relationships. Second, many folks frame the world in government-to-government or nation-to-nation shorthand, as though international discourse is a board game where you can represent Germany with a wooden block. The Fulbright suffers from neither of those contemporary dysfunctions. As cities and towns across the globe still smoldered from the cataclysm of World War II, Senator J. William Fulbright of Arkansas argued passionately for creation of a student exchange program precisely because it would “turn nations back into people, contributing as no other form of communication can to the humanizing of international relations.” As a result of his tireless advocacy, the American Congress in 1946 passed the Fulbright Act, which directed that proceeds from the sale of surplus war property and from foreign loan repayments be used to fund the promotion of international good will through the cross-border exchange of students in the fields of education, culture, and science. Can you imagine anything less flashy, less salacious, or less immediate – but more powerful and more valuable – than that? The first nation to sign an agreement to establish a Fulbright program with the United States was China (in 1947), followed by Burma, the Philippines, Greece, and then New Zealand in 1948. By my count, Fulbright now operates in 159 countries. Since 1948, more than 3,000 Kiwi and American Fulbrighters have crossed the Pacific to learn, to travel, to experience, to share, to get to know, to humanize. Overall, since its formation, the Fulbright has sent more than 325,000 people across borders, making it by far the largest exchange program in human history. Size isn’t everything, though, so it’s worth noting that the Fulbright is also widely regarded as the most influential international exchange program in history. For good reason. Thus far, 45 Fulbrighters have won Nobel Prizes, more than from any other award or exchange program. In fact, only four sovereign nations have more Nobel laureates than does the Fulbright program. 86 Fulbrighters have won Pulitzer Prizes. The roster of Fulbright alumni in NZ is filled with artists, writers, politicians, scientists, business executives, and educators who have greatly enriched the quality of life in New Zealand, who have deepened American understanding of Kiwi society in ways that advanced New Zealand’s interest, and who have – I should add, because some folks only measure value in monetary terms – stimulated significant economic activity here. 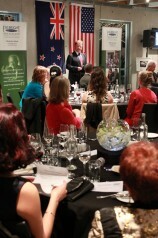 The US-New Zealand Fulbright partnership is unequivocally worth commemorating, celebrating, and supporting. Support is essential. Because of its human scale, academic nature, and long-term focus, Fulbright is sometimes a funding challenge, particularly in tight budget times, and particularly in a Short-Attention-Span era when things that sparkle, flash, or shout more effectively draw our focus and our dollars. This 65th anniversary provides an opportunity to tell the Fulbright story and mobilize supporters who recognize and embrace the wisdom and value of Senator Fulbright’s experiment. 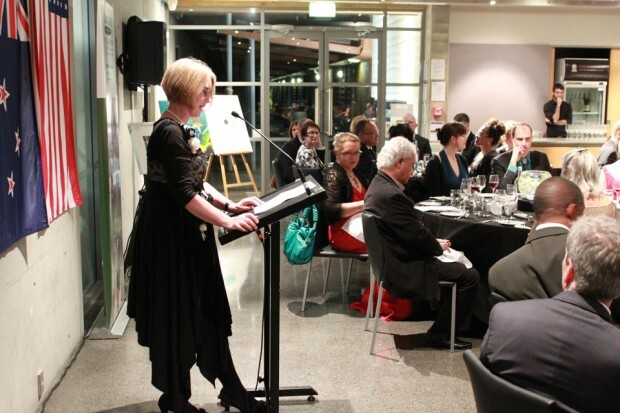 Fortunately, there is already a committed core of Fulbright supporters here in New Zealand, including the dozen folks who serve diligently – and without compensation – on the Fulbright New Zealand governing board. I would like to acknowledge one such supporter this evening. Scott Optican is a professor of law at Auckland University. An American who came to New Zealand a decade ago, Scott has served on the Fulbright board for six years, the maximum term of service under the board’s bylaws. I greatly appreciate Scott’s contributions to the program, and I would like to ask you to join me in thanking him for his service with a round of applause. 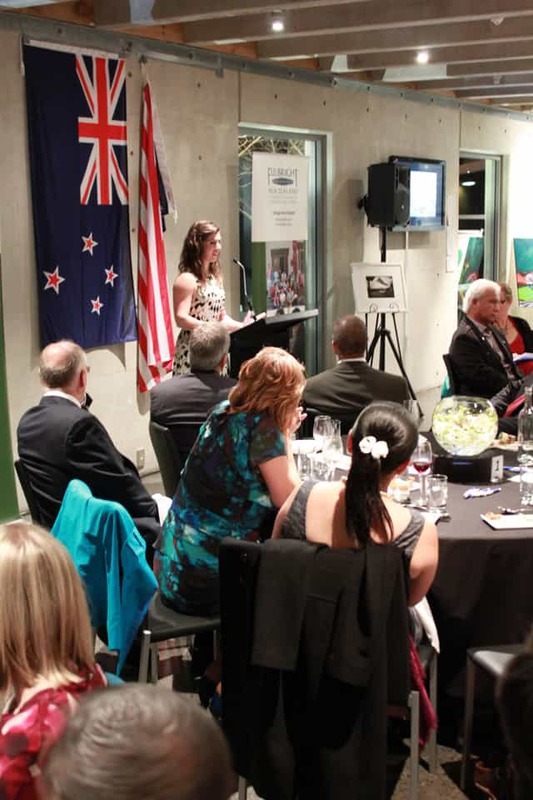 “As we celebrate 65 years of success and cooperation, we look forward to the continued vitality of the Fulbright program in New Zealand and across the globe. Our need to vigorously pursue Senator Fulbright’s vision has not diminished. In celebrating the Fulbright program, we reaffirm its purpose of helping to create a better world for our children and grandchildren, one that is more secure, prosperous, and free. “Congratulations again on this special milestone signifying the strength and vitality of the bonds between our two peoples. Thank you to both governments for their continuing support of the Fulbright program, and thank you to all of you who have joined us tonight to mark this special occasion. Kati ake i konei. Mate atua kotou e manaaki. I met up with a good friend of mine recently at a bar. It was those types of bars you only read about in novels from the Jazz age or see in black and white movies. Where framed photographs of famous black and white rock stars stare out from the walls like modern day saints on stained glass windows. My friend was depressed. She nursed a whisky on the rocks as one does when contemplating one’s woes, life and the universe. She tells me that she had just read Voltaire’s Candide, a most distressing tale about the hatred of optimism, and she was now drowning in existentialist angst. She tells me that just as poor Candide realises, she has realised that there is no point in doing anything in life if all there is in the world is nothing. Despite her rather morbid misinterpretation of poor Candide, I decide to tell my friend a tale. A tale about a young woman much like herself, who is given a chance to go to a place of higher learning in a far away land. Despite the risks, the woman gains an incredible amount of knowledge, acquires a plethora worth of skills and most importantly realises that her own potential is limitless. My friend interrupts me with the harsh rattle of her emptying whisky glass, ‘what’s the point in taking risks if there is nothing to risk for?’ So I proceed to tell her more. In this magical land, this woman found friends, colleagues and soul mates whom she would forever be tied to, to whom she would forever call upon when the need arose and most importantly to whom she shared a mutual love and connection that dreamers only ever dream about. She even experienced the magnificence of romantic love with a beautiful Prince, and then experienced its horrid cousin, unrequited love. My rant is once again interrupted. ‘A ha!’ My friend cries, the whisky blurring her inhibitions so that all of her gestures are exaggerated and monstrous. ‘Then what is the point of love if it only ends in heartache or separation? ’ So I continue with my tale except this time I tell her another. This is the story of the Hero with a Thousand Faces. Our hero lacks conviction but one day is given the chance to take a risk to leave his world and find the ultimate treasure. On his journey he must overcome everything he has ever feared, love like he has never loved before and most importantly realise that the treasure he was so searching for was within him the whole time. He returns from his journey to his world forever changed but changed for the better. My friend smiles for she finally understands that even for poor Candide, it was the journey and not the destination. It’s moments like this when I just want to pinch myself. When I realise that it is actually me standing in the front of a room, speaking about the incredible experiences that I’ve had as a Fulbright Scholar here in New Zealand. This was not supposed to be my life. In fact, for some time I was convinced that I would remain in the restaurant industry, spending my evenings serving the people who were listening to speeches like this one. But that is not me today, and the fact that I am here this evening is as much a testament to the hard work and long hours that I’ve put in, as it is to the people sitting in this room, who believe that someone like me can actually make a difference when given the chance. Now, I’ve been asked to share some of the experiences that I’ve had over the past year and a half and to be perfectly honest, not a whole heck of a lot happened my first year. I always felt like the odd one out during our report-backs since honestly, I spent most of my time with my nose in my books. My classes were demanding and I wanted to do well, so I didn’t have much of a social life. It paid off however, and I received a number of awards for the work I did with the Te Hana Community Development Trust, and some of my urban design work will be published later this year. It wasn’t all work though. I’ve managed to see the Auckland Philharmonic a number of times; I’ve met the principal ballerina with American Ballet Theatre and saw her perform Swan Lake with the Royal New Zealand Ballet; I’ve laughed with the Laughing Samoans; seen countless exhibitions at the Auckland War Memorial Museum which is in my backyard; survived my first cricket match; enjoyed an wonderful Thanksgiving dinner at the Ambassador’s House and made countless new friends from all over the world. In other words, despite the fact that I’ve yet to travel to far from Auckland, I’ve had an amazing time immersing myself in New Zealand culture. I decided after the end of my first year though, that I really wanted to achieve this elusive work-life balance that everyone else seemed to have. And so, like any other person in the same situation, I signed up to run a marathon! And just to make sure that I stayed committed to getting outside, I also joined a rowing club! Most people might think that this is a bit overboard, but there is nothing like getting out on the water at 5:30 when the water is as still as glass, and seeing the sun rise and light up the sky behind the Sky Tower in brilliant oranges, pinks and purples. This is truly a city that I’ve come to love. To say that I’ve had an incredible time here in New Zealand would be an understatement. Four years ago, I was getting ready for yet another shift at the restaurant. Today, I am getting ready to make a real, tangible difference in the world in which we live, living a life that I thought happened to other people. So in closing, I would like to sincerely thank those of you who have and who continue to support the Fulbright programme. You have a special place in my heart, because I have learned that the will to change your situation can only get you so far. It takes a network of support and people who believe in you. I te tuatahi mihi ki te atua nana nei I hanga ngā mea katoa. Tuarua ki ngā tangata e wheturangihia ki te po, haere, haere, haere atu ra. A huri ki a koutou, te hunga ora. Ngā mihi nui ki a koe. A, huri ki a koutou ngā kai whakahaere, ngā mihi tino nui ki a koutou mo te kai reka rawa atu. Kia ora everyone. I wanted to start with a quick traditional Māori greeting. Firstly I just wanted to acknowledge the atua or God or whatever greater power you believe in. Then I just acknowledged those who have gone before us. Not only our own loved ones but all those Fulbrighters that paved the path for us to follow. Then I wanted to acknowledge all of the distinguished guests here tonight, in particular those who organised the event. Thanks for the delicious kai! Doors opened for me in terms of employment – I am an extremely young law lecturer at the University of Auckland. I now have this amazing network of incredible people doing huge things all around the world. Whilst at Harvard I had the opportunity to interview Burmese refugees in Thailand. 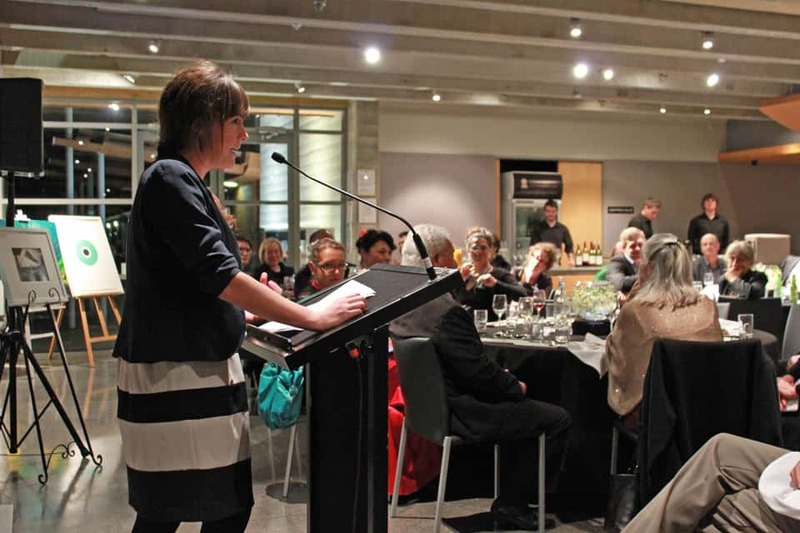 But as much as it benefitted me personally – and I hope that in my life I will go on to do some things of value to the NZ community – I think that the benefit of this sort of scholarship and experience has a way broader impact than that. I grew up in a little town called Teteko – it is an all Māori community. My primary and intermediate years were at a Kura Reo Rua, a bilingual decile 1 school. And although there are many, many beautiful parts to that community there are a lot of disadvantaged kids from there and the whole community tends to get a bit of flack as there is a strong gang presence there, high unemployment rates etc. But I went back to my old school a couple of days before I went to Harvard to visit the kids and do a talk there. And these kids, most of them mischief little things, were so engaged and amazed when I talked to them about where I was about to go and that I had been to the same school as them. For the mana of that community. As it is a positive not negative story coming out. And also makes big dreams seem more possible. If I can do it – and I went to the same school as them – why can’t they if they wanted to? Once you get people that others can relate to, into these world-class institutions – and show that New Zealanders and Māori and Pacific Islanders can foot it with the best in the world – it has a trickle-down effect. It makes what was previously not even on the radar, possible, for the communities from which these people have come. Just look at the Ngā Pae o te Māramatanga Graduate Award in the past four years it has been established. Out of four students that received it, three of them have gone to Harvard to do their masters, and one to do a PhD. We can get into these institutions. We just need the opportunity. I know I couldn’t have gone there without the support of Fulbright. So I would like to encourage alumni and whoever, to keep supporting this wonderful initiative that is Fulbright – as not only does it benefit the specific individuals – but my opinion is that it opens up doors for the community.